Containers of water showing various levels of turbidity, in NTUs. Turbidity is how we measure how clear water is to see through. Cloudiness from turbidity is caused by the amount of particulates floating around inside the water. 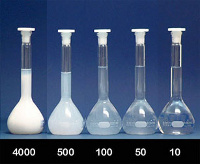 This measurement is a key method to determining an amount of waterâ€™s quality. The most common unit of measurement of turbidity in drinking water is the NTU, or Nephelometric Turbidity Unit. In the United States, the highest allowable level of turbidity in drinking water is 0.3 NTU, with the goal of keeping water supplies at 0.1 NTU and lower. Turbidity is made up of a variety of substances, from microscopic plant life to sediment. Itâ€™s the first warning sign that there are contaminants in our water, since we see it right away. Material found in turbidity can carry dangerous bacteria, chemicals, or toxic heavy metals like mercury or lead.